When seven sudha swaras are kept, written or sung in the systematic order then it is called as saptak (octave). That is “Sa Re Ga Ma Pa Dha Ni”. Madhya Saptak is nothing but medium octave. In Hindustani Classical Music raagas three type of compositions are prominent, Slower composition, medium composition, and fast composition. The medium composition of the raag is called Madhya lay khyal. Music is central to the concept of rhythm or lay. Rhythm musical notes just like humans, can be said to be an innate feature. The same action repeatedly occurring at regular time intervals as a rhythmic pattern. It lay in the structure of Indian music is called. Art music as an ancient Indian culture and tradition in all ages depict the glory has been. Today its inception, music has been to redefine the creative art of grandeur has evolved through several stages. Different traditions and culture associated with the demise of people is so difficult to travel between the new historical and cultural research reflects a variety of Indian music. Many of the country's mix of musical styles of the species is not in any other country, which India's ethnic diversity, to express. In Vedic India music period. When sent his son Brahma, narada Muni to compose music on Earth to teach the world to a new era of peace and quiet to build according to a principle of the human race. Music, each generation exhibits the glory that was an ancient Indian culture and tradition as art. Today its inception, music has been to redefine the creative art of grandeur has evolved through several stages. Different traditions and culture associated with the demise of people is so difficult to travel between the new historical and cultural research reflects a variety of Indian music. Many of the country's mix of musical styles of the species is not in any other country, which India's ethnic diversity, to express. During the Vedic period, which means to sing in unison a pronunciation Swariya Padhati singing, was used in music first started as Mntrochcharn,. SNA: a dual voice has taken the form of the "saga songs" by singing these chants in SNA Padhati. In fact "is called the" singing Spta Swara Pdhdtion seven notes in Vedic notes, double notes and such other Vedic mantras, was launched. Modern studies in Vedic period each house music was honored as an outstanding art that turns out. In this context, who made significant contributions to the development of Indian music guptakalin music, Indian music is always lively history. Known for developing many new country music ' in ' modern Indian music-new changes art is simple. Vocal music, instrumental music and dance: it's always three of Indian music is considered as that. Namely, two of the three major forms of Indian classical music through: North Indian classical music or Hindustani classical and southern carnatic music or classical music of India. It is believed that the beginning of the Indus Valley civilization period in the history of classical music, the only evidence claim God Rudra Shiva dances and a bronze statue of the girl dance, drama and music in worship at that time though the trend. Indus Valley civilization, Vedic hymns and incantations music stage of prayer and worship of God were in the style of music began after the collapse. In addition, two Indian Epics-the Ramayana and Mahabharata, the main impact of the music building. Pdhdti is a sea change in musical style and cultural in the modern era from India – period. Such as Kalidas, Tansen, Amir Khusrau as the biggest in the history of Indian music composers Indian music Pandit Ravi Shankar note that has contributed to the advancement of gururaj Joshi, Pandit jasraj, etc. bhimsain, Prabha atre, Sultan Khan, music fans, is maintained even in today's age. Indian classical music is known as South India's carnatic music, and music in this genre such as harp, violin, etc. Mrindgm is used on several musical instruments. South India, Tamil Nadu, Kerala, Andhra Pradesh and Karnataka, carnatic music is prevalent in rayon. Carnatic music subjects are mainly religious hymns. Hindu deities are praising. Carnatic music, Indian classical music, the goal of such melody and rhythm as the voice of any other major organs are like. Carnatic music as strong foundation of talented musicians from the hands of etc is an integral part of the musical instruments and the same tr Mahalingm, m is too. His eternal through Karnataka classical music compositions have made waves in the international area preachers. Because of his many awards and honors have been granted these compositions and the like have become the region's credit column. There are some great musicians of the region names as follows:-Ms subbulakshmi, Madurai Mani Iyer, Ms Sharma, etc. Balasubrhmnym. To find out about the culture of India shows and art is very large and has a parallel Smridhd. Raag, Sanskrit dictionary, "coloring or dyeing work is defined as" (the mind) and "any emotion or passion in particular overpower the love, affection, sympathy, desire, interest, pleasure or delight"? Music, both artist and listeners melodic sounds on the impressions of these descriptions apply a raag required and optional melodic movements within a performance notes are rules governing the manner in which the rules of a raag notes, That are used can be defined by emphasizing ornamenting notes or specific way.-Ed-the credence they ascended or descended from alternate or musical scale required manner, which shows these phrases and/or combine them to emphasize relative pacing between the octave notes or frequency range for the day and/or raag can be performed at the time of the season the phrase as feelings of Raag for maximum effect on the emotional state and the artist and the listener. Hindustani classical music lakshan geet usually are in these compositions simple pools etc tone samvadi Aaroh, avaroh, singing or playing a melody, a lyric tenor as Vadi melody describes and is important in the initial phase are modest creations Hindustani classical music. Lord Krishna and Goddess Radha and Kajree compositions typically based on Monsoon which is a style of singing. Ras Kajree major in makeup. Kajree is usually found in Manipur and Banaras Gharana. There are seven Swaras of a Thaat forever. but a raag minimum five swaras can be accomplished with Jati in a raag of swaras can be described by the number of use. Sampuran Sampuran: Raags in this classification will have all the seven notes in the ascending as well as descending movements. Sampuran Shadava: Raags in this Jati will have seven notes while ascending and six notes while descending. 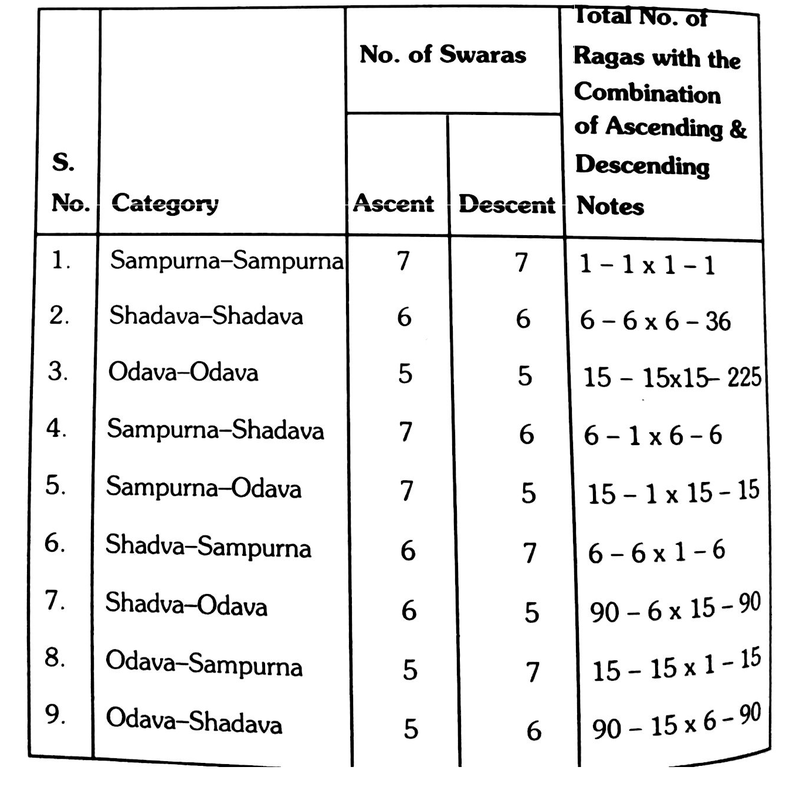 Sampuran Audava: Raags in this category will have seven notes while ascendingand only five notes while descending. Shaudava Sampuran: Raags in this classification consists of six note ascending and seven descending notes. Shaudava Shaudava: It has six notes ascending six descending. Shaudava Audava: Raags in this Jati will have six ascending and five descending. Audava Sampuran: It has five ascending and seven descending. Audava Audava: Raags in this category will have five ascending and five descending. Audava Shaudava: It has five ascending and six descending. According to traditional books of Indian Classical Music designation of vadi swar in a raag is like a king in a kingdom. Usage of vadi swar is more then any other swar in a raag. Speciality of any raag is depend on vadi swar because of this vadi swar is also called as ‘Jeev swar ‘or ‘ansh swar’. A good artist uses vadi swar in different ways like singing vadi swar again and again, sarting a raag with vadi swar, to end a raag with vadi swar, singing vadi swar many times in important places with different-different swaras or sometime singing vadi swar for longer time in one breath. Vaid swar is also helpful to identify the time of singing or playing a raag. If vadi swar of a raag is from purvang part of saptak i.e. “Sa Re Ga Ma”, then it is called as purvang vadi raag and usually time for singing or playing purvang vadi raagas are from 12 pm to 12 am for example raagas like Bhimpalasi, Pilu, Purvi, Marwa, Yaman, Bhoopal, and Bageshree etc. have purvang vadi swar and so the time for singing and playing these raagas is between 12 pm to 12 am. In the same way if vadi swar of a raag is from utrang part of spatak i.e. “Pa Dha Ni” then it is called as utrang vadi raag and time for singing or playing utrang vadi raagas is from 12 am to 12 pm. For example raagas like Bhairav, Bhairavi, Bilawal, Kalingada, Sohini, and Asavari etc. have utrang vadi swar and so the time for singing or playing these raagas is between 12 am to 12 pm. Vadi swar has one more significance that if only vadi swar is changed in a raag then it also changes a raag weather the swaras of raagas are almost same. For example raag Bhimpalasi, and raag Dhanashree, these two raagas come from the same thaat i.e. thaat kafi, and in both the raagas komal “Ga-Ni” are used but when raag bhimpalasi is sung or played then swar Ma is shown many times because it is a vadi swar of raag Bhimpalasi and when raag Dhanashree is sung or played swar Pa is seen more because swar Pa is vadi swar of raag Dhanashree. Thus it is concluded that if only vadi swar is changed in a raag then raag is also changed. Hindustani classical music compositions composed three types, slow, medium composition, and composition are raagas. Melody of fast composition is called as drut khyal. In ancient books raagas are shown in three differences. 1. Shudh Raag: In a raag when other raagas swaras are present and even then it doesn’t resemble those raagas then it is called as Shudh raagas. 2. Chayalag Raag: In a raag when other raaga swaras are present and if it also resembles those raagas then it is called as Chayalag raag. 3. Sankirna Raag: A raag which is found by combination of two or more raagas then it is called as Sankirna raag. 1. Base of Hindustani classical music i.e. “Bilawal Thaat” is to be considered as shudh (pure) thaat. Because Bilawal Thaat is the only thaat that has all 7 shudh (pure) swara’s of saptak. 2. All raagas are detailed in 3 divisions. Audav (Raagas with 5 swara’s). Shadav (Raagas with 6 swara’s). Sampurna (Raagas with 7 swara’s). 3. Less than 5 swara’s and more than 7 swara’s cannot form a raag. 4. Audav, Shadav, and Sampurna changes in their aaroh- avroh gives rise to 9 differences. 5. In every raag thaat, aaroh-avroh, vadi-samvadi, time. These things are compulsory. 6. There is 4 swara’s difference between vadi swar and samvadi swar. If vadi swar is in purvang part of saptak then samvadi swar would be in uttrang part and vice-versa. 7. An evening raag can be changed to a morning raag by changing vadi swar of that particular raag. 8. To bring beauty in a raag vivadi swar can also be used sometimes. 9. In every raag there is a vadi swar, which has its own importance in a raag. Based on vadi swar only we can notify weather a raag is uttar raag or purv raag. 10. In Hindustani classical music tradition raagas can be divided into three divisions. Raaga’s with Komal “Re - Dha”. Raaga’s with sudh “Re – Dha”. Raaga’s with Komal “Ga – Ni”. Shadhi prakash raaga’s which sung or played on sunrise is and sunset comes under first division. 11. In Hindustani classical music tradition swar Ma is known very important. It is also called as “Advadarshak Swar”. Because of this, time of day night are set. 12. Raagas in which swar “ Ga – Ni” are Komal, those raagas are mostly sung or played during noon or night time. 13. After sandhi prakash raagas, raagas with shudh “Re – Ma – Dha – Ni” are usually sung or played. 14. Sa, Ma and Pa these three swaras usually have their importance in the raagas which are sung or played in the third half of the day and night. 15. Swar “Tivra Ma” is mostly found in night raagas. In day raagas usage of this swar is very less. 16. “Sa – Ma – Pa” swaras from this combination can be seen in uttrang and purvang part of saptak. The raagas which can be sung or played at any time, those raaga’s vadi swar is one of these swaras. 17. In any raag swar Ma and Pa both cannot be excluded. If swar Ma is excluded in a raag then swar Pa will be included and vice-versa. 18. In any raag swar Sa is not excluded. 19. In raagas usually a swar with two forms (Komal - Tivra) should not be included together but some raagas like raag Lalit are exception to this principal. 20. Raaga’s sound beautiful if they are sung in their specified time, but while performing on stage this rule could be broken. 21. Swar Tivra Ma and Komal Ga in one raag are found less. 22. Raagas with both Ma (Shudha and Tivra) are usually somewhat similar to each other. Difference in these raagas is usually found in aaroh. 23. Raagas are which are sung and played in first half of the night and also have both madhayam (Ma). Those raagas have simple rule that shudha Ma is used in aarohand avroh as well, but Tivra Ma can be seen only in aaroh. 24. Raagas which are specified to be sung and played in the first half of the night, in those raagas it is also noticed that in aaroh swar Ni is vakra and in avroh swar Ga is vakra. Usually in aaroh of these raagas swar Ni is rarely seen. 25. In Hindustani classical music tradition raagas are given more importance when compare to taals. In carnatic classical music tradition is different. Taals are given more importance when compare to raagas. 26. Purva raagas importance in aaroh and uttar raagas magic in avroh is seen. 27. Usually from every thaat purv-raag and uttar-raag can be born. 28. In serious kind of raagas swar Sa Ma and Pa are very important and more importance of these swaras lies in mandra saptak, but this is not seen in shudra raagas. 29. In sandhi prakash raagas there is essence of peace. Raagas with shudha “Re Gha Dha” swaras represents beauty and laughter and in raagas which have komal “Ga-Ni” swaras represents braveness and danger. 30. During entering from one Thaat’s raagas to another Thaat’s raagas “Permal Praveshak” raagas are sung and played. 31. Sandhi prakash raagas are sung during sunrise and sunset and after that, raagas with shudha “Re-Dha” are sung or raagas with Komal “Ga-Ni” are sung. 32. Raagas which have swar komal Ni. E.g. Raagas from thaat, kafi and khamaj, in those raagas sometimes shudha Ni is also used. 33. In any raag when swaras are sung or played then it becomes less, more or equal to become week, strong or equal. 34. Combination of two, three or four swaras is known as taan not a raag. 35. Raagas which are sung after 12 pm and which are sung after 12 am, in those raagas order wise “Sa Ma Pa” consistently becomes stronger. 36. Raagas which are specified to be sung in the noon in their aaroh swar “Re-Dha” are week or excluded and in these raagas swar Re and Ni are used more. 37. In raagas which include vadi swar from “Sa Ma Pa” are usually serious in nature. 38. In morning raagas swaras komal “Re Dha” are strong and in evening raagas swaras shudha “Dha Ni” is to be seen more. 39. “Ni Sa Re Ga” by this swar combination we can easily identify that this resembles from sandhi prakash raagas. 40. Purv-raagas reflection in aaroh and utter raagas reflection is seen in avroh. Dhrupad is a vocal genre in Hindustani classical music, the musical tradition said to be the oldest still in use. The name of the poem (pole) is used as a part of the word pole and refrain pada (verse), is derived from. Duration of poetry and verse form is rendered it can denote both the style. Chaiti CHAIT a semi-classical songs sung in the Hindu calendar month. These verses in March / April during the holy month of Sri Rama Navami is provided. It comes in classical Hindustani light classical music.The song is typically the name of Lord Rama. In this context, Dadra is a light classical vocal form in Hindustani classical music, which is mostly in Agra and Bundelkhand region. The original (which was borrowed from the word for style) Dadra Tal went along, but later Dadra compositions often (such as keherwa) are found in other light Talas. As well as examples of Madan Mohan (music director) composing be -Lag Gale, a song for the movie Who was that some Bollywood songs have been on the same basis. Mallika-e-Ghazal Begum Akhtar Come on then sang a famous Dadra our Atariya is there. Thaat in Hindustani classical music are born a thaats particular name that started with raagas. It is said that special chord melody shelter, thaat has been based on the chord name. For example, Ni Sa Re Ga Ma Pa Dha. By combining the tone that we can conclude this Bhairav ​​thaat. Thaat the popular Raga Bhairav ​​thaat Bhairav ​​these swaras and construction came from the same given name. Raga Bhairav ​​thaat shelter is similar in Raga Bhairav. Thaat-vachak shelter melody also known as passion. In the history of North Indian classical music raagas are ten shelter. In Hindustani classical music, the notes in a Raga which are neither Vadi and Samvadi are called its Anuvadi notes. They are often treated as companion or attendant to the notes. Alap is opening section a typical North Indian classical performance. it develops a melodic improvisation that the introduction and melody is a form of improvised alap Dhrupad Singing in unmetered., (raga) and unaccompanied (tanpura drone), except, and started on a slow pace. Totally free improvisation, rather than many musicians alap schematically, for exampleby way of vistar, where at one time, the notes of a melody are introduced so that the phrase or a note from the above what has been included before would never traveldown. in such cases, a new octave can be a powerful event in accessibility. Instrumental music, it is loud when a steady pulse in the alap is launched; When thespeed has increased drastically, or rhythmic element overtakes the melodic jhala(Dhrupad: nomtom) is called. Loud and jhala, as different classes of performance or can be seen as parts of the alap; Similarly, jhala tilt can be seen as a part of it. Avroh in their descending order of swaras describes how the raag moves. It is also called as avrohi or avrohan. Aaroh in Indian classical music in its ascending order of swaras describes how the raag moves. It is also called as aarohi or aarohan. 1. Sampurna has seven notes ascending and descending. 2. Shadava has six notes ascending and descending. 3. Odava has five notes in the same Swaras, both ascending & descending. 1. Ragas must belong to a Thaat. 2. At least five notes are essential for a Raga. 3. In a Raga the melody is very essential. 4. A Raga must have its own ascent, descent (Aroha and avaroha) and fixed notes (Nadi & Sammdi). 5. The Sa Swara (C note) is the same note (fixed) in every Raga, and both Ma & Pa are not to be omitted at the same time. There are 4 distinguished parts of a raga/composition/ song. 1. Sthayi First part (face) or introduction. 2. Antara Second part or body. played in the upper octave.